Happy Real Wedding Wednesday Modern Wedding Brides! I've got an absolutely beautiful wedding to share with you this morning, and a simply gorgeous couple who celebrated their marriage recently with a romantic reception in Sydney. This wedding really caught my eye because of the joy in both Lauren and Luke's faces, the absolute delight that radiates from their expressions and fills their photographs. "We had the most amazing day!" said Lauren. "It was filled with so much love, fun and laughter. I have never felt so nervous in my life as I did before walking down the aisle. I almost cut off the circulation to my Dad's hand!" An especially meaningful and entertaining ceremony kicked off the celebrations. "Our priest had the church laughing loudly at his stories of a couple in bed together," Lauren laughs. "The story had a message, but it took a while to get there! I was just so excited to finally be married to the love of my life." "Our bridal party had a ball posing at our first photography location in Centennial Park and shared more laughs in the bridal suite at Sergeants Mess. At one stage the entire bridal party - all ten of us - were cramped in the lift before being announced to our guests at the reception... we stood waiting in the lift talking for a few minutes and didn't move until we realised no-one had pressed the button to go up one floor. We just stood there waiting... it was a very funny moment." Lauren created a soft, romantic theme for the reception, filled with flowers and tea light candles "The reception was stunning, it was everything I had imagined. The floral centrepieces matched our bouquets and features of my dress were carried through onto the cake. People still talk about the speeches from the night. Luke, who isn't a confident speaker, wrote his speech approximately nineteen times. He absolutely stole the show with his humour, emotion and honesty. He had the room in stitches during the garter removal as well, when he came out from under my dress with a set of fluffy red hand cuffs. He had hidden them in his jacket pocket. It was a surprise for everyone, the whole room loved it. I wish I could live the day again." Congratulations to Lauren and Luke! What an absolutely beautiful day, we wish you all the best. Do you have a real wedding you'd like to share with us? Email us [email protected], find us on facebook or tweet us @ModernWeddingOz. And don't forget tto enter to Win your wedding photography Click Here. p.s. 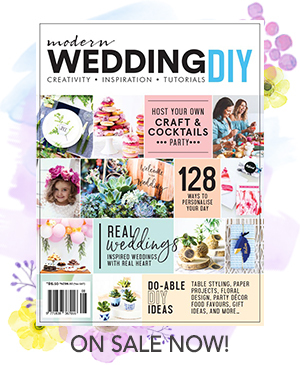 Become a Modern Wedding Bride for loads more real weddings, inspiration and seven essential planning tools to make your day a cinch!